Stained glass windows aren’t just reserved for churches, cathedrals and mansions! They are also suited for use around the home. In fact, adding stained glass windows to your property can significantly help you to customise your home and make it feel truly yours. Stained glass is a form of decorative coloured glazing that has been used to customise the appearance of homes and buildings for nearly a thousand years. Made by adding metallic salts to molten glass in the production process, once cool, these small sections of glass could be crafted into the larger stained glass windows and motifs that characterise traditional architecture. Mostly used within opulent buildings and, in particular, religious buildings, stained glass windows were incredibly hard to make and required a lot of skill on the part of the craftsmen and women involved in their creation. Stained glass windows would have to be carefully designed, would have to support their own weight and would have to be weatherproof: all very challenging obstacles to overcome for the medieval craftsperson working with a limited set of tools. This meant that they were very expensive and only really available to those with considerable finances. Why use stained glass around your home? Thankfully, stained glass production has come a long way over the centuries and its now financially viable to be able to install stained glass into your own home for the ultimate touch of personalisation. Investing in a unique stained glass section in a window or door can help you to truly customise your home, make a unique statement with the appearance of your property and to personalise the environment in which you and your family live. Stained glass as a glazing medium is perfect for adding elegance and opulence to your property. 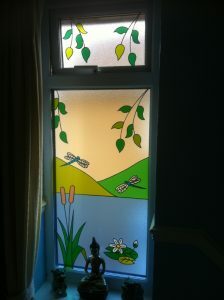 Customise your home with stained glass today! You can incorporate stained glass in a variety of different ways around the home. Perhaps the most effective though, is using it in windows and doors in your property. Here at K Glazing, we’re experts when it comes to creating and installing a range of high quality stained glass glazing designs . We have over 40 years experience of the glazing industry, making us one of West Yorkshire’s most skilled double glaziers. Whatever type of stained glass design you’re looking for, we can help. Our team of craftspeople can create a bespoke stained glass designs, completely tailored to the individual needs of your home, or if you’d rather something simpler, you can choose from a range of standard designs that our team can create. If you’re looking to enhance and enliven the aesthetic of your home, stained glass windows are a very useful product to invest in. Discover more about how stained glass can improve your home by requesting a free quote or by giving us a quick call on 01977 700025.